Figure 20.1. 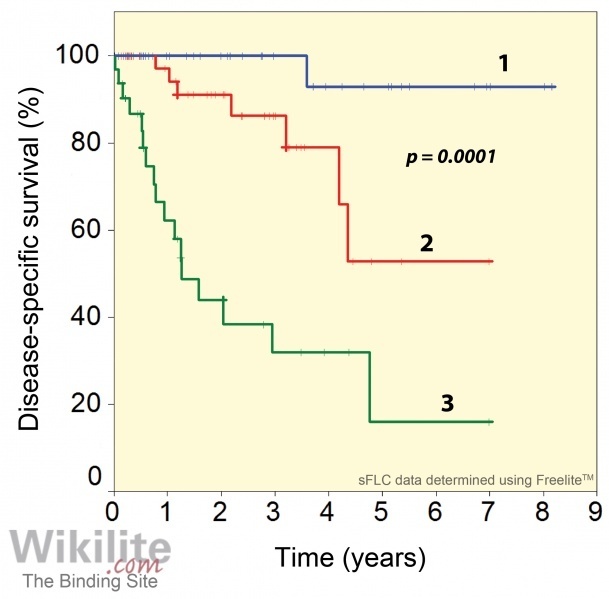 Disease-specific survival of MM patients according to baseline κ/λ sFLC ratios. Figure 20.2. Kaplan-Meier overall survival plot according to tertiles of baseline concentrations of sFLCs. 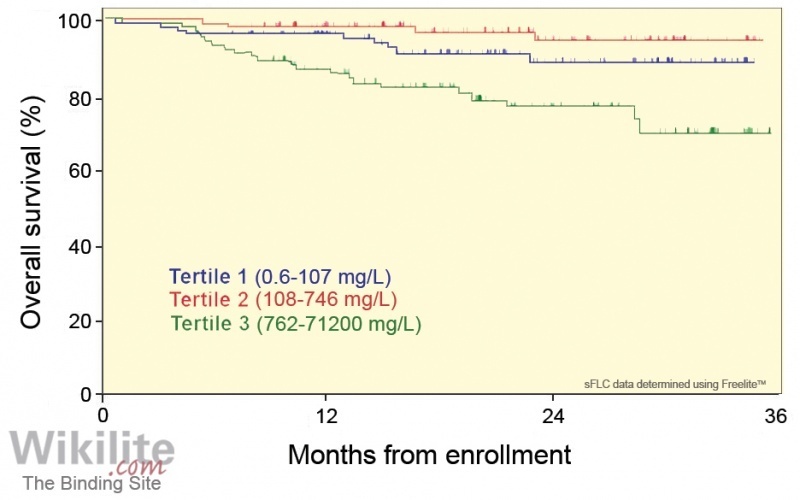 Outcome was inferior among patients with top-tercile sFLC baseline levels. (This research was originally published in Blood © the American Society of Hematology). There are now a number of published studies which have assessed the relationship between sFLCs at disease presentation and subsequent outcome. Kyrtsonis et al. investigated the prognostic value of baseline sFLC ratios in 94 MM patients. The median baseline κ/λ ratio for κ MM was 3.57 and λ/κ ratio for λ MM was 45.1. 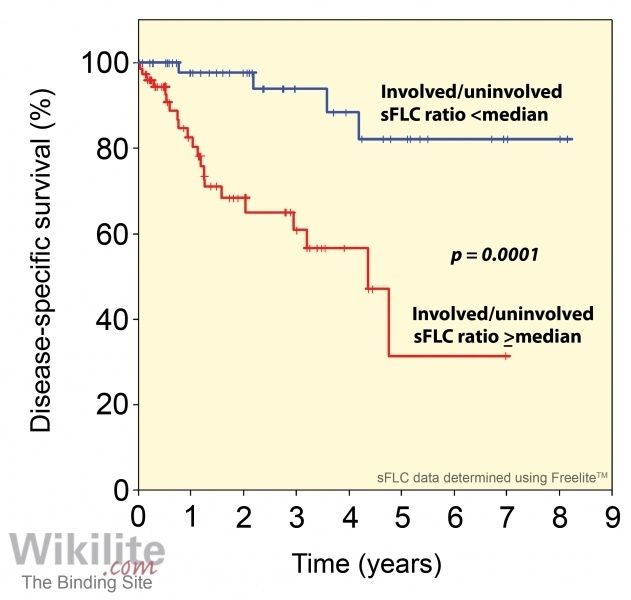 Importantly, the 5-year disease specific survival for patients with involved/uninvolved (iFLC/uFLC) sFLC ratios < or ≥ median values was 82% or 30%, respectively (p<0.001; Figure 20.1). In a similar study of 790 patients at the Mayo Clinic, Snozek et al. found that abnormal sFLC ratios at presentation were again important, independent markers of outcome. The authors calculated κ/λ ratios for all patients and showed that those with ratios <0.03 or >32 had a median survival of 30 months compared with 48 months for those with ratios within the normal range (0.26 - 1.65; p<0.001). Similar findings were reported by Meddour et al. . Preliminary analyses of other studies have further supported the prognostic value of sFLC measurements . More extreme ratios at diagnosis independently predicted worse overall and progression-free survival in 118 consecutive patients treated between 2002 and 2008 . Similarly, Garcia de Veas Silva et al. reported that an iFLC/uFLC >50 predicted a poor outcome in a study of 170 newly diagnosed MM patients. Conflicting data on the prognostic value of the κ/λ sFLC ratio have also been reported: a study by Lopez-Anglada et al. of 309 MM patients failed to demonstrate a difference in PFS between those patients with highly abnormal κ/λ sFLC ratios (<0.03 or >32) at baseline compared with those with a less abnormal values (0.03-32). Dispenzieri et al. divided their study population (n=399) into tertiles based upon the patients’ sFLC concentration (iFLC or dFLC [difference between the iFLC and uFLC concentrations]) or sFLC ratio. In all analyses, the lowest tertile had the best event free and overall survival although outcomes for the upper two tertiles were very similar. van Rhee et al. also divided their study population (n=301; all intensively treated) into tertiles but solely based upon the concentration of sFLCs. They observed good separation of the survival curves for all three tertiles, with the highest concentrations predicting the worst outcomes (Figure 20.2). Several studies have confirmed the prognostic value of the involved sFLC concentration at baseline . Tacchetti et al. analysed the outcomes for 110 patients treated with first-line therapy including bortezomib and concluded that a baseline sFLC concentration >100 mg/L was associated with more aggressive disease, characterized by a lower probability of achieving a complete response (CR) and shorter progression-free survival. Most of the studies discussed in this chapter have sought to establish whether FLC analysis is prognostic independently of other markers. However, it would also be of value if a simple serum test could replace a more expensive and/or invasive investigation such as multi-parameter flow cytometry or cytogenetic analysis. Kumar et al. studied the relationship between sFLC results and the presence of IgH translocations in 314 MM patients at diagnosis. The median κ/λ sFLC ratio and dFLC were higher in patients with IgH translocations, particularly t(14;16), but multivariate analysis indicated that sFLC abnormalities were independent risk factors and better prognosis was obtained using a combination of both the genetic and sFLC risk factors.